Whether its a walk, race, parade or fireworks, locals will have plenty of ways to keep busy on July 4. The Evesham Celebrations Foundation is once again set to host a Fourth of July packed full of events with the township’s annual Independence Day events. The day will start bright and early with the 10th annual Marlton Mayor’s Cup 5K & and 1 Mile Fun Run at 8:30 a.m. Rain or shine, the event will take runners and walkers down a stretch of Main Street with electronic chip timing, a mid-race water station and post-race refreshments available to all those who participate. Moisture wicking t-shirts are also guaranteed for all runners who pre-register before June 30 at www.eveshamcelebrations.org or before July 3 at Fleet Feet Sports Marlton Crossing Shopping Center, 109 Route 73. Pre-registration for the run will cost $25, with a fee of $20 to participate in the walk. Registration will also be open on the day of the event, from 7 to 8:15 a.m. at the Main Street Firehouse. Race day registration for the run will cost $30, with a fee of $20 to participate in the walk. Once the runners and walkers have had their fun, kids in grades five and below are welcome to participate in the annual Independence Day Kids Bike Parade. The course starts at the Main Street Firehouse and lasts through the Wiley Home at Plymouth Avenue. Children who ride in the parade may decorate their bikes as long as children can still operate the bikes safely, and helmets must be worn during the event. Parents are also allowed to walk their children during event push them in strollers or pull them in wagons as long as they are strapped in. Children in wagons without straps must also wear a helmet. Those looking to participate in the bike parade are asked to meet at the Main Street Firehouse by 10 a.m. to register. 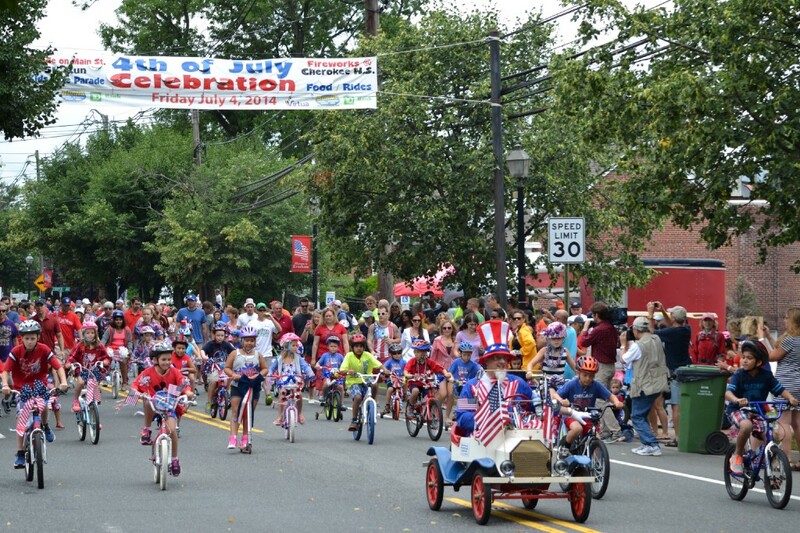 Following the Kid’s Bike Parade will be Evesham’s annual Fourth of July Parade starting at 11:30 a.m. Residents are encouraged to bring their chairs and blankets and find a good spot along Main Street to enjoy to community groups, live music, floats and more. After the Fourth of July Parade, residents can take a break for the rest of the day until 7 p.m. when the doors at Cherokee High School open for the township’s annual fireworks display. Local vendors will be on hand with food and drinks, with skydivers dropping at 8:15 p.m. and the annual fireworks display starting at 9:30 p.m.